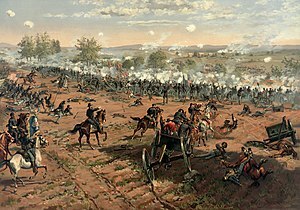 The Battle o Gettysburg wis focht Julie 1–3, 1863, in an aroond the toun o Gettysburg, Pennsylvanie, bi Union an Confederate forces during the American Ceevil War. ↑ See: Rawley, pp. 145-169. ↑ Coddington, p. 573. See the discussion regarding historians' judgment on whether Gettysburg should be considert a decisive victory. ↑ Busey and Martin, p. 125: "Engaged strength" at the battle wis 93,921. ↑ Busey and Martin, p. 260, state that "engaged strenth" at the battle wis 71,699; McPherson, p. 648, leets the strenth at the stairt o the campaign as 75,000. ↑ Busey and Martin, p. 125. ↑ Busey and Martin, p. 260, cite 23,231 tot (4,708 killed;12,693 woondit;5,830 capturt/missin). See the section on casualties for a discussion o alternative Confederate casualty estimates, which hae been citit as heich as 28,000. This page wis last eeditit on 11 Apryle 2017, at 18:23.